Hey! There are two types of people in this world: Chumps and people who follow our blog. Which one are you? I got some more asparagus from Kate & Mike's Naturally Grown in Woodbridge, Connecticut. While this asparagus is always so good it makes me want to enjoy it au naturale, you can only have so much plain steamed or grilled asparagus. For tonight the mission was to put it together with some other ingredients for something a little more interesting. First, however, it was time for another in a long line of kale salads. For this one I used some nice organic watermelon. I only bought it because I don't think we'd ever had organic watermelon before as it is fairly uncommon. It was also cheap which, in tandem with scarcity, is one of my favorite food pairings. 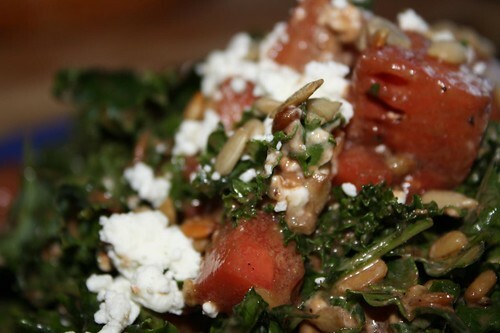 I cubed up the watermelon with some kale, sunflower seeds, goat cheese, balsamic vinegar, and olive oil. For the pasta I browned some garlic, orange zest, lemon zest, and a little vidalia onion olive oil. I would normally add red pepper flakes and dried oregano to this but apparently Jen performed a mercy killing on our ancient red pepper flakes and we didn't have any oregano so I omitted them from the recipe. 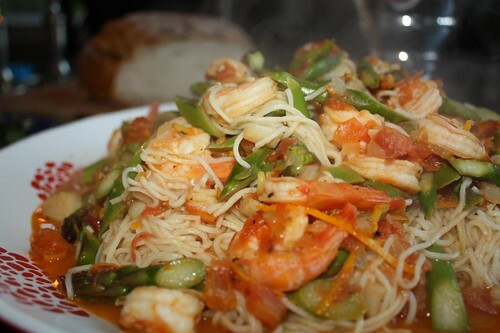 I added some concassed tomatoes, scallops, and shrimp with the asparagus tips. Essentially this is an arrabbiata sauce which is Italian for "angry." Jen seemed fairly docile until her Halak on the Canadiens let in a really soft goal. Hard to tell if the pasta affected her temperament at all. I haven't done a science experiment since the eighth grade but I believe this one needs a variable. Or a control. One of those. 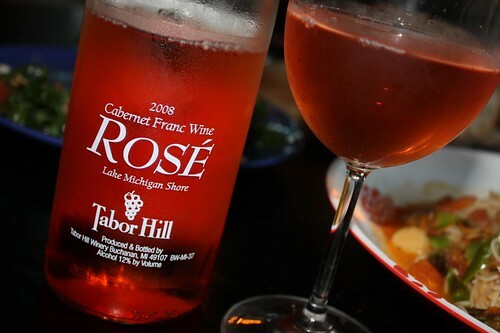 As accompaniment Jen picked out a bottle of Cabernet Franc Rose from Tabor Hill which we acquired on our wine tour of Michigan last summer. We purchased this wine straight from the next town over from the vineyard after touring it. That's just doing our part in reducing our carbon footprint! Just forget about the flight to Michigan, the flight back, and the fact that we weren't allowed to take it on the plane so Jen's dad had to drive it back to Illinois, then back to New York later that year. Hey, we're no heroes. We're just doing our part to help the environment. Last night I used up the last of the giant four-pound container of strawberries to make strawberry ice cream. I think that these strawberries may be mutant or have some strange quantum properties that reverse or neutralize aging. They were in the fridge for a week and were essentially unchanged. Generally I'm used to strawberries going bad within minutes of purchase, often in the car ride home from the store. I'm curious if these are actually even real strawberries and not just strawberry-flavored pieces of plastic based on their unprecedented integrity. When we lived in New York City our annual tradition was to go to the local Mister Softee truck which parked on our corner. 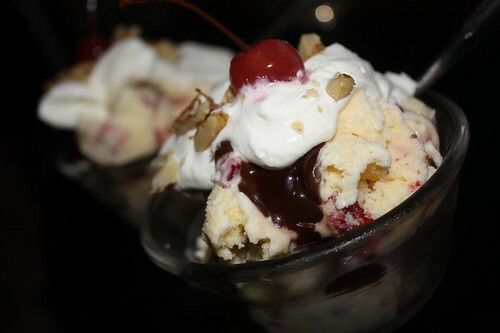 There we'd spend about $10 for some kinda nasty soft serve ice cream generally in the form of a pineapple sundae. We'd then take this home to enjoy during the NHL Playoffs. This year we had to change this up to a nightly trip to Longford's where we pay about $6 for some really great homemade ice cream usually in the form of a cone to eat while we watch the NHL Playoffs. That's just one of the many perks of our new suburban lifestyle. That ice cream looks SO DELICIOUS. I wish I could eat some right up. Its a fact that even though we each cheer for a different team, nothing makes the Ernst girls angrier then their goalie letting in a soft goal.